Mythology or theology? And would you invite this person to a cookout? Did the Council of Nicaea recommend niacin? Is Pelagianism related to plagiarism? Is the father of 70 children called a Septuagint? Does the Kenotic Theory explain the mystery of why Ken is no longer with Barbie? And can anyone you’d want to invite to a cookout even pronounce Eutychianism, what less know what it means? Okay, so you might know the answer to some of the above, but let's face it, theological sounding terms and the word ‘theology’ itself just smacks of confusing academia—and of old dead guys in the Church—and seems to have little to do with the simplicity that is in Christ. 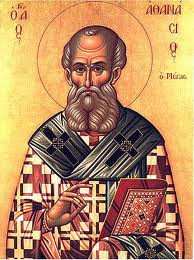 ['Dead old guy' Athanasius, pictured below, died way back in 373, and we'll get to him shortly.] Besides, all you really want to do is be able to share a prayer, a song, or a timely meaningful word with your sisters and brothers. You're not after a PhD. Perhaps you’ll find encouragem ent in the words of respected theologian T.F. Torrance from pages 445-446 of the Epilogue of Atonement: the person and work of Christ. (Okay, T.F. died at the age of 94 in 2007, so we respectfully admit he’s an ‘old dead guy in the Church’ now too, but let's focus on the meaning of his message.) He says being attuned to and governed by the mind of Christ “is much more important than being able to offer a formal academic account of some doctrine or historic debate in the church.” And he spoke of developing a sort of theological instinct. “I have been wonderfully blessed with a mother and a wife who have a profoundly Christian, and indeed a remarkably theological, instinct. My mother had little academic training in theology, but her life and her understanding were so tuned in to the mind of Christ that she knew at once where the truth lay and was quick to discern any deviation from it. This is also very true of my dear wife, who is imbuded with an unerring theological instinct…. But T.F. says this type of instinct isn’t thinking out of our own reason (what he calls ‘unbaptised human reason’), but rather is thinking from a mind transformed by, and having its center in Christ. He equates trying to think of God out of our own reason as merely dealing in myth—doing mythology rather than theology, and refers to some sound teaching from Athanasius, (who you already met above). “As Athanasius used to insist, we must learn to think strictly ‘in accordance with the nature’ of God the Father as he is made known to us through the Son and in the Holy Spirit, that is, in an essentially godly way. To think like that from a center in God himself, in accordance with his essential nature revealed in the incarnate Son, is, he claimed, what theologia strictly is…. Either you think from out of a mind centered in God through union with the mind of the Lord Jesus, or you think from out of a mind centered in yourself, alienated from God and inwardly hostile to the truth incarnate in the Lord Jesus…. Torrance describes this transformation / renewal of the mind as assimilating the mind of Christ during our “never-ending discipleship in repentant rethinking as we take up the cross and follow Christ” and ongoing prayer, worship, and offering ourselves to God daily through the reconciling, atoning mediation of Christ (Rom 12:1-2). If you can say, "the simplicity that is in Christ," you can start the cookout.